This is my working calendar as of January 2013. I have only posted up dates I actually celebrate when the dates come around, in my own little way. Other dates will be discussed or added in another colour later on. For now, I am working on blog posts outlining some of the ritualistic aspects for each day. Take note some of the days are listed as days for particular deities, I don’t spend time worshipping the deity; I spend time tapping into their Universal energies, which are shared with my own. Ultimately I am tapping into myself to draw out their aspects for the sake of magick and personal development (As above, so below; So below, as above). On both Egyptian or Hellenistic days I recite poetry or remember their myths before or after ritual – meditating on each message. The four solar maxima dates (solstices and equinoxes) I have listed below are part of the formula of AIθHΡ. They are shown in red writing. You will also notice there are five letters and I list four dates, that is because the letter theta “θ” represents the whole year. The Thelemic High Holy season runs from March 20 – April 10, and are marked in green. Make sure to post your own Holy Calendar on your blogs too! Month of Janus, Roman God of the Gate (beginnings and endings, past and future) – this month is important for many reasons, but it mostly is a time of reverence for the self. I work with Janus a lot during this short period, working with the energies of truth, change, strength and divination to define what I need to do to change as a person. I hold January as the first month of the year. 1 – The last day of Janus Breaks – a ritual I named after one of my favourite episodes of ROME. It consists of a small ritual wherein I ask him for blessings, protection and insight. At the end of the ritual I “open” his essence into the world by libation or burning his image over a white candle. 2 – Dionysus day – Honour the male mysteries, and both Dionysus and Bacchus. I use this day as a symbol of tapping into my male energies and syncing them with my female energies. We have both, so why not work with both? 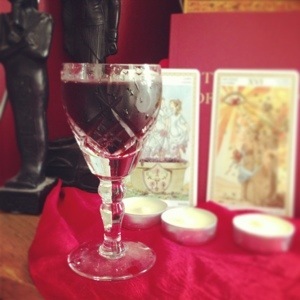 I perform a ritual for the body and mind, in order to make my inner energies flow as one for better magickal practice. 23 – Festival day of Hathor/Sekhmet – I perform libation and ritual for both aspects of these fierce women, and also tap into my inner woman. Hathor represents love, passion and protection; Sekhmet represents forgiveness, protection, fury and retribution. 2 – Feast of the Stars, is ruled by the element of air and all that corresponds with it. The letter of this day is “A” alpha. The deity is that of Nuit-Isis, represented by the officer, Mater Coeli. I celebrate a personal and simple ritual based on the Thelemic group ritual. Offerings, meditation and magick are important on this day. It also symbolises the sun passing through Aquarius. 6 – Aphrodite day – Love and fulfilment; hope and pride. 14 – St. Valentine’s day – Honouring the heart and love. I also do mediations on this day to focus on love for my Gods, my heart and myself as a single lady. I also ask Aphrodite or St. Valentine’s to take away feelings of sadness and loneliness; thus making my heart numb over time. I try to send my love into my magickal workings and myself. 20 – Thelemic New Year – Feast for the Supreme Ritual, which is performed from midday. I did my own little version earlier this year with my bell, green cloth and Stele of Revealing on my altar. I didn’t follow the actual outline for the ritual itself, but I developed a solitary version for next year, as this year I wasn’t able to perform due to my university interview falling on that day. 1 – Feast of Cattle is ruled by the element of earth and all that corresponds with it. The letter of this day is “I” iota. The deity is that of Osiris, represented by the officer, the Heirophant. I celebrate a personal and simple ritual based on the Thelemic group ritual. Offerings, meditation and magick are important on this day. It also symbolises the sun passing through Taurus. 20 – Athena day is a great time to meditate on the wisdom of Athena and perform ritual to her in order to find her wisdom in myself, and blessings of clarity and justice. 12 – Zeus day is important to me. I go to him for consul, protection, blessings and guidance. As he is one of my main patrons I make sure to spend most of my waking hours performing little rites to him through libation, meditation, writing or just working on myself, my behaviour and attitude. He is my Father above. 7 – Apollo day is another very important date for me, in which I spend the day doing rituals to the sun above and creating ritual items for the following year. 14 – Birthday of Asur (Osiris) approx. 15 – Birthday of Heru-Dunawhy (Heru-Horus) approx. 16 – Birthday of Set, approx. 17 – Birthday of Auset (Isis) approx. 18 – Birthday of Nebet-het (Nephtys) approx. 1 – Feast of the Lion-Serpent is ruled by the element of fire and all that corresponds with it. The letter of this day is “R” rho. The deity is that of Mau or Hathor-Sekhmet, represented by the officer, the Empress. I celebrate a personal and simple ritual based on the Thelemic group ritual. Offerings, meditation and magick are important on this day. It also symbolises the sun passing through Leo. 13 – Hecate day and my birthday. A day I find to be incredibly symbolic of my relationship with Hecate and the female mysteries. I also view this day as my physical growth point of developing my magickal skills, and divination practice. 23 – Nemesis day is the day I let go of all of my troubles (hoping Zeus has given me permission) to ask Nemesis for help, protection, revenge and karmic retribution to be paid to those who have wronged me. I have a selection of lovely poems and incantations that work perfectly, and never to cause harm, only to teach one a lesson for the sake of growth. 12 – Crowleymas! And a special anniversary for me! 15 – Mars day is spent performing rituals to Mars in the hope of gaining intelligence, strength and protection. 31 – Feast of the Dragon is ruled by the element of water and all that corresponds with it. The letter of this day is “H” eta. The deity is that of Apophis, represented by the officer, the Magister Templi. I celebrate a personal and simple ritual based on the Thelemic group ritual. Offerings, meditation and magick are important on this day. It also symbolises the sun passing through Scorpio. 11 – Bacchus day is similar to Dionysus day, so I repeat celebrations or celebrate once a year. 18 – Perdurabo day is a small day within the Thelemic community. It marks Crowley’s first initiation. 1 – Feast of To Mega Therion marks the anniversary of Crowley’s death. 25 – Heru-Dunawhy’s other birthday, but you celebrate Horus the younger on this day. It is also Mithras day, Christmas day and such. I also like to read a little H. P. Lovecraft for the sake of Cthulhu. 31 – New Years Eve and the first day of Janus Breaks. Rites start from midday and end on January 1st at midday.